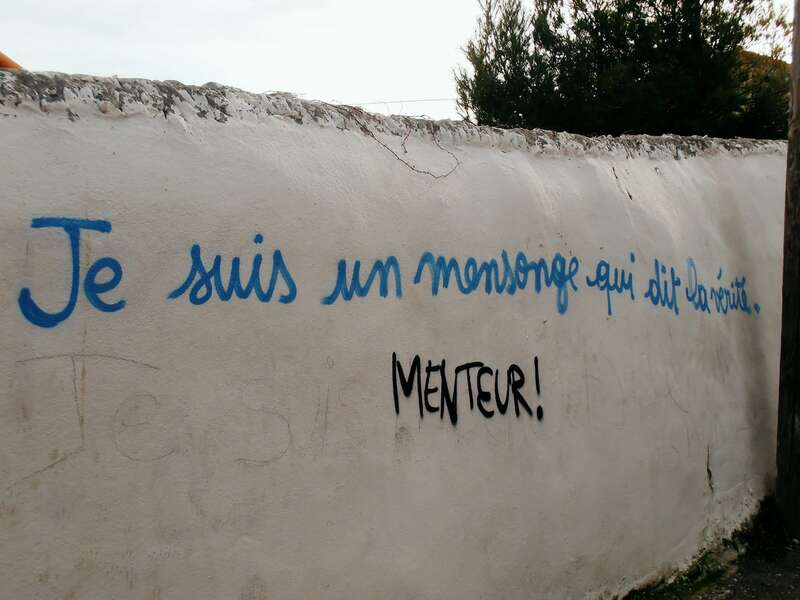 Photo of a Marseille Wall (“Le Suis Un Mensonge Qui Dit La Vérité”. “Menteur!”/ “I Am A Lie That Speaks The Truth.” “Liar!”)” by Jeanne Menjoulet. Used Under A Creative Commons License. A newly-translated-to-English report reflects on how the country handled misinformation and politically motivated document leaks in its 2017 presidential election and offers 50 recommendations for how gouvernements, société civile et acteurs privés could tackle similar problems. The findings are compiled in a hefty 200 pages from a working group between France’s foreign affairs minister’s policy planning staff and France’s research institute of the Ministry for the Armed Forces. Information is increasingly seen as a common good, the protection of which falls into all citizens concerned with the quality of public debate. Above all, it is the duty of civil society to develop its own resilience. Governments can and should come to the aid of civil society. They should not be in the lead, but their role is nonetheless crucial, for they cannot afford to ignore a threat that undermines the foundations of democracy and national security. Why did #MacronGate not work? On Friday, May 5, 2017 — two days before the second round of the French presidential election — someone(s) hacked 9 GB of data from the campaign of Emmanuel Macron, the eventual victor against right-wing leader Marine Le Pen.Two days before that, and two hours before the final televised debate between Le Pen and Macron, a user with a Latvian IP address posted fake documents on 4chan about Macron’s alleged offshore account — which were soon amplified by pro-Trump Twitter accounts using #MacronGate and #MacronCacheCash. BUT. There is good news. Don’t do what the U.S. did: Paris had already observed the Democratic National Committee’s miserable response to its own hacking, plus American intelligence services had warned its French counterparts about Russian interference attempts during the French campaign. Rely on the proper administrative actors: France has two agencies in particular that were robust in watchdogging the campaigns, monitoring cybersecurity, and ensuring the integrity of the electoral results. Raising awareness via the media, political parties, and the public before and after the hacking: One of the aforementioned administrative actors even offered an open workshop on cybersecurity for the campaigns. Signal a united front: The government already in power showed its resolve and determination to stem foreign interference, both in its words and actions. Take technical precautions: The administrative actor heightened security at each step of the electoral process, even ending electronic voting for citizens abroad because of risk of cyberattacks. Pressure digital platforms to act: Facebook removed 70,000 suspicious accounts in France as recently as ten days before the vote took place, thanks to pressure from the government and from the public. Highlight all hacking attempts: Macron’s campaign had already been talking about its susceptibility to hacking and responded in hours with a press release when the leaked documents were dropped. Hit back on social media: Campaign staff systematically and quickly responded to Macron Leaks posts or comments. Use humor: Dry, dull government-speak isn’t exactly as viral as being funny in responding. Call out actual propaganda outlets: Macron’s campaign ceased offering RT and Sputnik press credentials in late April and continuing in Macron’s presidency. Macron even highlighted their work as “organs of influence, of propaganda and of lying propaganda” during a joint press conference with Vladimir Putin, which must’ve been jolly. Compartmentalize communication as a rule of thumb: Use email only for trivial and logistic matters, use encrypted apps for confidential items, and save sensitive conversations for face-to-face. What’s the media’s role in this? Train journalists on if one should and how to cover a massive leak, detecting a fake profile, reacting to extremist content. The researchers suggest using this as guidance.